The University of the Philippines Mathematics Club (UPMC) will be hosting the 45th Annual Nationwide Search for the Math Wizard, one of the country’s most prestigious math competitions in the collegiate level. The event will be held on February 17, 2018 at the University of the Philippines Diliman. The competition is open to all undergraduate college students. Eliminations will be held at the Institute of Mathematics while the final round will be held at the NISMED Auditorium. 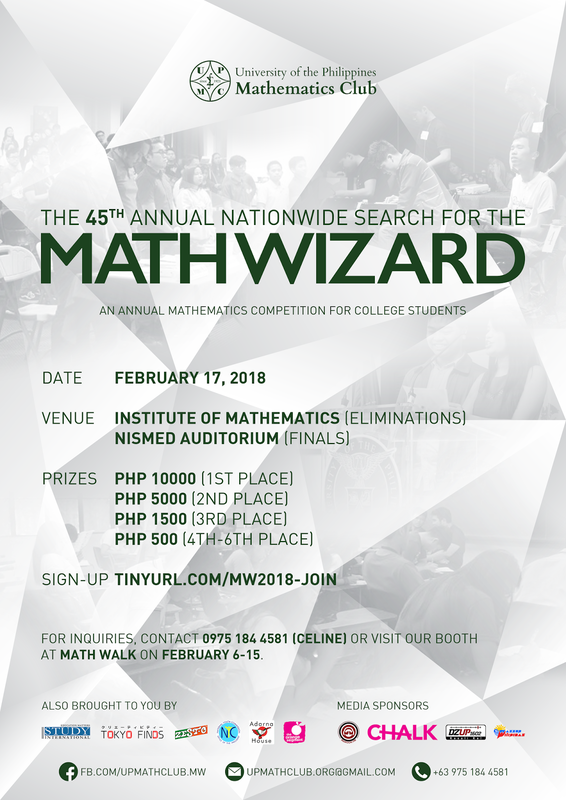 Coverage of the competition will be: Algebra (Linear, Vector, and Analytic), Geometry, Trigonometry, Elementary Statistics and Probability, Logic, Number Theory, Elementary Calculus (Differential and Integral), and applications of the topics listed. The registration fee for the event is Php 230 for early registrants and Php 250 for walk-in registrants. Cash prizes will be given to the winners: 4th-6th place – Php 500, 3rd place – Php 1500, 2nd place – Php 5,000, and 1st place – Php 10,000. You may register online through this link: tinyurl.com/MW2018-JOIN. The mechanics of the competition can be viewed at tinyurl.com/MW2018-RULES. facebook.com/upmathclub.mw. You may contact us at 0975 184 4581 (Celine) or upmathclub.org@gmail.com. You may also visit our booth at the UP Diliman Institute of Mathematics until February 15, 2018. To request for an invitation, kindly send a message to our Facebook page, or send an email to upmathclub.org@gmail.com. This event is presented by the UP Mathematics Club. Also brought to you by UP Diliman Institute of Mathematics, Study International, Tokyo Finds, Zest-O, National Youth Commission, Adarna House, and Orange Segment Print and Design Studio. With our media partners Maroon FM, CHALK.PH, DZUP, and Wazzup Pilipinas. Established in 1921, the University of the Philippines Mathematics Club is a non-stock, non-profit university-wide organization dedicated to promoting and sustaining students’ interest in mathematics through competitive and friendly activities. To learn more, visit facebook.com/UPMathematicsClub.